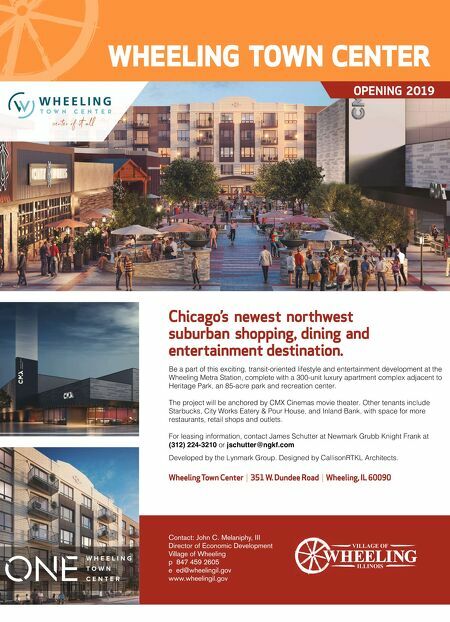 The new Wheeling Town Center is located at the "center of it all" in the heart of Chicago's prestigious northwest suburbs. There are over 1,000 new apartment units in various stages of development within walking distance of the Wheeling Metra Station. Wheeling is an ideal community to operate a business. Wheeling is a diverse and dynamic community of 40,000, distinguished by its unique balance of industrial, commercial, and residential neighborhoods. Additionally, Wheeling is known regionally and nationally as home of the Milwaukee Avenue "Restaurant Row" district, which offers an enviable variety of dining and entertainment options for residents and visitors. Economic Development Director John Melaniphy reports, "Wheeling is in the midst of over $230 million in new development projects. "Retail sales amounted to over $625 million in 2016 in Wheeling, up from $598 million in 2014. Hotel occupancy is over 72%, and the Westin Chicago North Shore Hotel is achieving the highest occupancy since opening." The Chicago's North Shore Convention & Visitors Bureau promotes the region's amenities and attractions, including Wheeling's hotels, restaurants, entertainment, and recreational facilities. The Wheeling Town Center and several major projects continue to spur interest in development opportunities in the Village, particularly along the Dundee and Milwaukee corridors. Construction is in progress on major new developments, including the Wheeling Town Center, the Whitley, and Wolf Crossing. Several infrastructure projects are being implemented, including the recent addition of new streetlights, intersection improvements along Dundee Road and Community Boulevard, Dundee and McHenry Roads, and Dundee and Elmhurst Roads. The $110 million Wheeling Town Center, a transit-oriented mixed- use development adjacent to the Metra station, is 10 months into construction. The master-planned development will feature approximately 300 luxury apartment units and 100,000 square feet of retail space anchored by CMX–a first-run movie and dinner theater, signature restaurants, fast-casual restaurants, and specialty stores. The project is a joint venture between WTC, LLC and the Lynmark Group. The residential building is up and currently being enclosed. Foundations are underway for the CMX Cinemas, City Works Eatery & Pour House and Starbucks. The project is expected to be completed in early 2019. Northgate Crossing is a transit-oriented 288-unit luxury apartment development located at 250 Northgate Parkway that was completed in 2017. Northgate Crossing features nine three-story buildings with 32 units per building, as well as attached garages, a clubhouse, walking trails, and other amenities. The project broke ground in October 2014; the clubhouse and first units became available in late 2015, and the project was completed in fall 2016. Reva Development is the developer for Northgate Crossing, and this project is in line with the community's Town Center area plan, which calls for a concentration of multi-family housing along with mixed-use commercial and residential development in proximity to the Wheeling Metra Station. Reva Development added a 12-unit townhouse development on the east side of Northgate Parkway, which were completed in 2017. With these major projects underway, the Wheeling community is well positioned for a productive year in 2018. Binny's Beverage Depot opened in the former Staples location on Lake Cook Road, and the Village is anxious for the opening of Boston Fish Market on Wheeling's Restaurant Row. The Village is working to secure a new tenant for the Sam's Club that closed during the national closure of 63 Sam's Club stores. Wheeling's Village Board recognizes the contributions made by its businesses and the partnership that is vital between the Village and its business community. To this end, the Village Board promotes a "business-friendly" atmosphere. If you are considering opening a new business, we encourage you to consider Wheeling. While Wheeling is an established suburb of Chicago, a considerable amount of property remains available for infill commercial and industrial development, including two Village-owned lots on Milwaukee Avenue. For information on location or development opportunities, please contact the Department of Economic Development at (847) 459-2605 or ed@wheelingil.gov. Wheeling Town Center Northgate Crossing Binny's Beverage Depot Soaring to New Heights Wheeling is establishing itself as a destination for entertainment, dining and luxury rental living.